This project was completed as part of my master thesis at Carnegie Mellon. 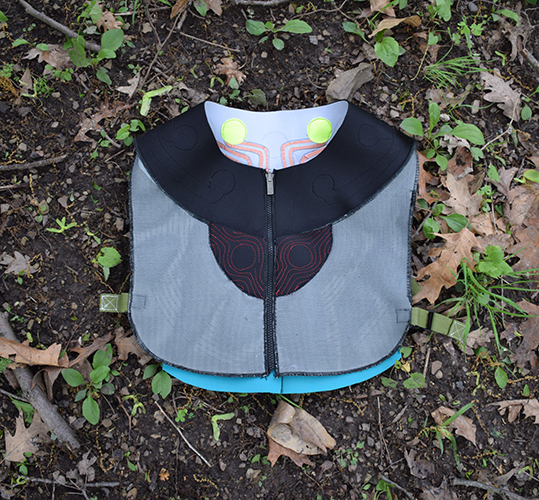 Tools for Collaborative Survival is a series of wearable tools for mushroom foraging. "Collaborative Survival", a concept coined by anthropologist Anna Tsing, describes how our (human) ability to persist as a species is deeply entangled with and dependent upon the health of a multitude of other species. By applying this concept into design practice, I explore how technology can help humans forge and sustain livable collaborations. pdf of accompanying 1-page mini zine! The Hand-Substrate Interface is a glove with embedded sensors that can be used to detect information about the substrate interface that is support fungal growth. The sensor inputs include soil moisture and temperature to determine the substrate conditions. The moisture sensor is built into the glove by embedding conductive materials so that the index and middle fingers of the glove become the probes. 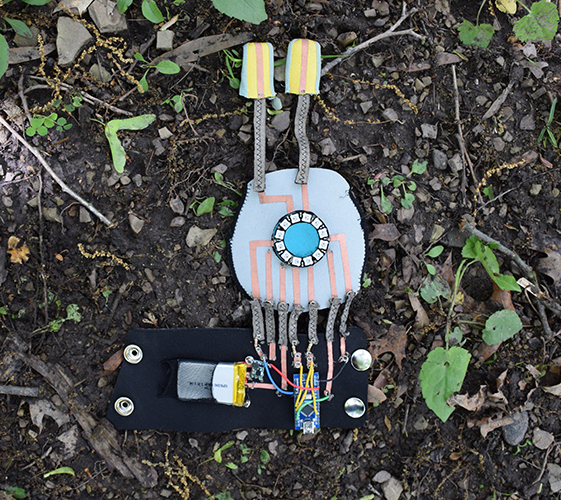 Data HarVest is a wearable device that maps a changing environmental landscape. The device supports logging of contextual information during the foray with a GPS tracker to mark places where fungi growth is found. This information is then stored in an online map that contains other locations identified by other mushroom hunters. Embedded vibration motors around the collar can then direct the wearer towards other locations to create a sensorial experience. 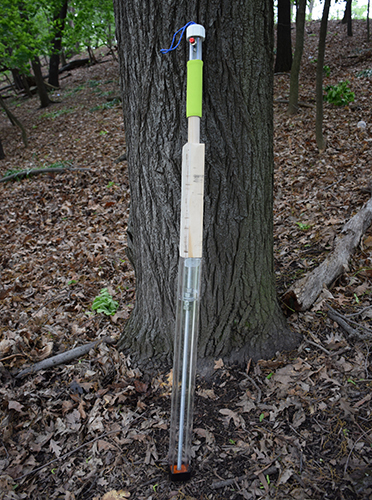 Spore Stepper is a walking stick that can be used to collect soil samples for spores that have been distributed into the earth by mushrooms. After a foray, the sample can be germinated or DNA sequenced to determine what fungi species may be present. This concept was initially inspired by soil and dirt becoming trapped in the treads of shoes.